Signet McCallister was so thrilled when she spied the pink vintage toilet at Community Forklift that she couldn’t form words. All she could do was lift her hands to her face and emit a joyful yelp. 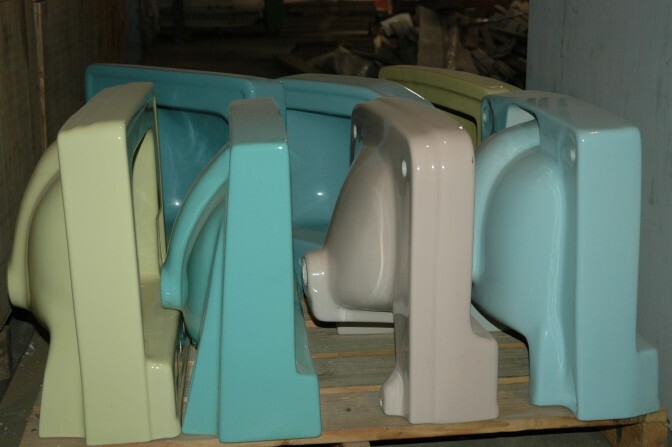 Donated sinks and other vintage bathroom fixtures come in a rainbow of colors. In early spring, she had ordered a pair of toilets—one pink, the other yellow—via the nonprofit’s listings on eBay. But instead of waiting for Matt Menke, the Forklift’s special projects coordinator, to ship them, she drove three hours from her 1880 home in Hampton, Va., to pick them up in Edmonston. McCallister’s expression and persistence confirmed what Menke had hoped was true: that Forklift fans from afar, especially those renovating historic homes, are elated to have online access to a veritable rainbow of donated vintage toilets. It’s all part of the Forklift’s recent efforts to move more inventory by beefing up its digital offerings. The longer the treasured toilets sat on the warehouse floor, the more likely they were to be cracked or chipped, and thus unsellable. That’s what prompted Menke to become the chief commode cleaner, crater and wrangler. Before a toilet can be listed online, he has to research its origins, scrub away scale and wax-ring residue, and inspect it to make sure it’s fracture-free. He’s handy enough to design and build sturdy, compartmentalized crates from scrap lumber. Each bowl, tank and lid is swaddled in carpet padding, polystyrene and insulation so they are babied on their way to destinations such as California, New York and Florida. Each toilet is carefully packaged in a handmade crate before being shipped to its new owner. “It’s not pretty, but nobody has complained,” Menke says about his handmade crates, adding that in Forklift fashion, they are substantial enough to be reused. His most exotic order came from a Netflix set designer tasked with creating a scene for a television series featuring a rundown New York City tenement from the 1980s. The Forklift had just the ticket—a pink tub and toilet that had taken a bit of a beating from errant carts in the warehouse. The potties, which weigh in at about 75 pounds apiece, are too heavy to be shipped conventionally. When Menke has one ready to go, he calls on the less-than-truckload hauler the Forklift has contracted with, and it’s hoisted into a 52-foot trailer. The driver has to execute a bit of automotive ballet to navigate the traffic and railroad tracks on Tanglewood Drive. Customers pay $250 per toilet, and more if they order a set including a sink and tub. While McConnell was at the Forklift, she also found a pink urinal that she couldn’t resist. 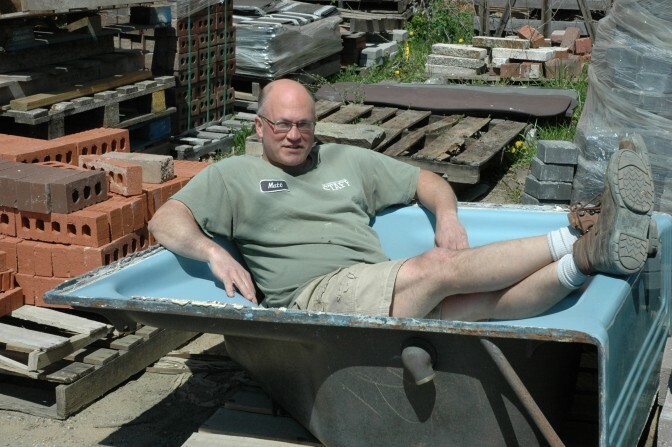 Taking a bathtub break between scrubbing and packing fixtures is allowed at the Forklift. Interest in colorful toilets evidently surged after first lady Mamie Eisenhower installed a pink one in the White House in the 1950s. Menke regularly handles varying hues of green, yellow, lavender and red. Indeed, conservationists have a valid argument that vintage toilets use more water than today’s standard of 1.6 gallons per flush. But Menke counters that keeping vintage toilets in circulation is worthwhile because mining and heating the clay to create the porcelain is such an energy-intensive process.